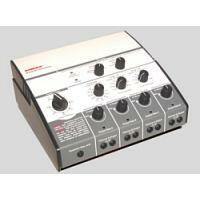 The MS401B is a quad-channel, eight-pad stimulator that provides both mono phasic and bi phasic stimulation. Output modes include continuous, surge, or reciprocal. The MS401B features selectable frequency, On duration, Off duration, and reciprocal duration. The MS401B stimulator incorporates a unique safety reset function as part of the intensity controls. Designed to promote patient assurance, the patient controlled treatment stop switch allows the patient to discontinue stimulator output at the press of a button. The MS401B is equipped with a full accessory pack that enables the practitioner numerous treatment possibilities. The MS401B features a 30-minute timer, a carrying handle, and detachable power cord. The MS401B is wall mountable. TENS/EMS Units & Stimulators can be found in our extensive online collection of products from globally recognized and trusted brands, including Amrex. An excellent option to consider is the Low Volt Bi Phasic / Mono Phasic AC Muscle Stimulator.